Most Ven. Rahula Maha Thera, etc. Sāriputta (Pali) or Sanskrit Śāriputra (Sinhala: ශාරීපුත්‍ර මහ රහතන් වහන්සේ )was one of two chief male disciples of Gautama Buddha along with Moggallāna, counterparts to the bhikkhunis Khema and Uppalavanna, his two chief female disciples. He became an arhat renowned for his teaching and is depicted in the Theravada tradition as one of the most important disciples of the Buddha. Śāri was his mother's name and is also a particular bird's name. Putra meant boy or child. He was also called Upatissa. This name came from his father's name, Tissa. In the Japanese language he is called Sharihotsu (舎利弗). Sāriputta was the eldest son of Śāri Brahmin lady & also eldest one to his brothers (Upasēna, Maha Chunda & Rēvata) & his sisters (Chāla, Upachālā & Sīsupachālā). 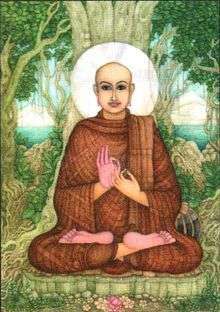 Sāriputta came from a Brahmin family and had already embarked on life as a spiritual ascetic when he encountered the teachings of the Buddha. Sāriputta had a close friend Moggallāna (Sanskrit: Maudgalyāyana), another wandering ascetic. They both renounced the world on the same day and became disciples of the sceptic Sañjaya Belaṭṭhaputta before converting to Buddhism. 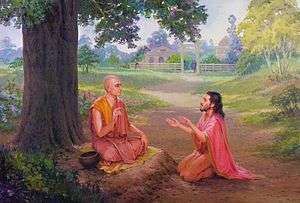 After hearing of the Buddha's teachings from a monk named Assaji (Sanskrit: Asvajit), Sāriputta sought out the Buddha and became an adherent to his teachings. These two are often depicted together with the Buddha, and several sutras regard interactions between Sāriputta and Moggallāna (who became renowned among the early Buddhists for his mastery of supernatural powers). Sāriputta often preached with the Buddha's approval and was awarded the title "General of the Dharma" (Pāli: Dhammasenāpati) for his propagation of the teachings and is regarded as the founder of the Abhidharma tradition. However, the Buddha also lightly reprimanded Sāriputta on occasion when he did not fully explain the Dhamma to a prince, or when he allowed a group of novice monks to become too loud. "If a person, rightly saying it of anyone, were to say, 'He is the Blessed One's son, his offspring — born of his mouth, born of the Dhamma, created by the Dhamma, his heir in the Dhamma, not his heir in material things,' he would be rightly saying it of Śāriputra if he were to say: 'He is the Blessed One's son, his offspring — born of his mouth, born of the Dhamma, created by the Dhamma, his heir in the Dhamma, not his heir in material things.' 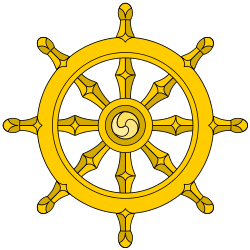 Sariputta, monks, takes the unexcelled wheel of Dhamma set rolling by the Tathagata, and keeps it rolling rightly." But, Ananda, haven't I already taught you the state of growing indifferent with regard to all things dear & appealing, the state of becoming separate, the state of becoming otherwise? What else is there to expect? It's impossible that one could forbid anything born, existent, fabricated, & subject to disintegration from disintegrating. Just as if the largest limb were to fall off a great tree composed of heartwood, standing firm; in the same way, Sariputta has attained total Unbinding from this great community of monks composed of heartwood, standing firm. What else is there to expect? It's impossible that one could forbid anything born, existent, fabricated, & subject to disintegration from disintegrating. The stupa of Sāriputta at Nalanda - where he was born and died. Sāriputta went to his native home, Nalaka, a Brahmin village, as he wanted his mother who was still a non-Buddhist to be shown the correct path and faith. He died at the village after being successfully able to convert his mother and make her a path winner. After his body was cremated the bones were taken to the Buddha by Cunda and on the Buddha's instruction handed over to King Ajātaśatru. 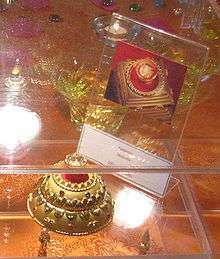 Ajātaśatru enshrined these relics in a Stupa which was venerated by the followers. In 261 BCE, King Dharmasoka opened the stupa on instructions received from Moggaliputta-Tissa, who indicated the Third Buddhist council. While depictions of Śāriputra in the Pāli Canon are uniformly positive, showing Śāriputra as a wise and powerful arhat, second only to the Buddha, his depiction in some Mahayana sources has often been much less flattering, serving often as a counterpoint. In the Vimalakīrti Sūtra, Sāriputra is depicted as the voice of the Hinayana or Śrāvaka tradition, which is presented in the Mahāyāna sūtras as a "less sophisticated" teaching. In this sutra, Śāriputra is unable to readily grasp the Mahayana doctrines presented by Vimalakīrti and others, and is rebuked or defeated in debate by a number of interlocutors, including a female deity (deva) who refutes Śāriputra's "Hinayana" assumptions regarding gender and form. Here Sāriputta questioned why, if she is so wise and capable, the deva has a female body. The deva then proceeded to teach a lesson in nondualism by switching their sexes, and stating, "in all things, there is neither male nor female." However, in the Lotus Sutra, Buddha does predict that Sāriputta will become a fully-awakened Buddha one day named "Flower Glow Tathāgata", at which Sāriputta's mind is said to "dance with joy". A dialogue between Sāriputta and Avalokiteśvara is also the context of the Heart Sutra, a brief but essential Prajñāpāramitā sūtra in Mahayana Buddhism. ↑ Ray, Reginald A. (1999). Buddhist Saints in India: A Study in Buddhist Values and Orientations. Oxford University Press. p. 132. ISBN 9780195350616. ↑ "Shariputra and the Goddess". College of Humanities and Social and Behavioral Sciences, Central Michigan University. Archived from the original on June 13, 2010. Wikimedia Commons has media related to Sariputta. Jack Daulton, "Sariputta and Moggallana in the Golden Land: The Relics of the Buddha's Chief Disciples at the Kaba Aye Pagoda"